The end of each year is often a time for reflection, as we look back on the year that was before we get ready to turn the page on a brand new year. When it comes to the movies, there's more than enough to reflect on, with countless amounts of "hot takes" starting to surface, including lists of the top 10 movies, but this year, we thought we'd try a different approach as well. Given how unique a year 2017 was at the box office, we decided to delve back through the year that was, and pick out the top 10 most interesting trends that developed among audiences this year, some of which could have quite the big impact on the movie industry for many years to come. 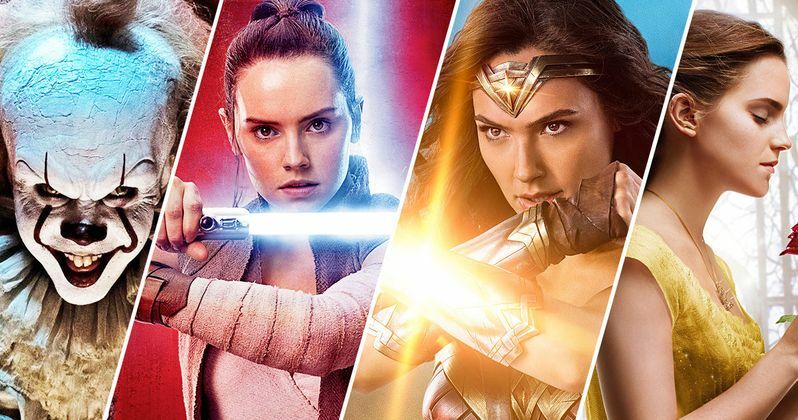 While the top 10 for this year isn't officially set in stone yet, since it's only a matter of time before Star Wars: The Last Jedi vaults to the top of the charts, overtaking the top-grossing movie for roughly three-quarters of this year, Disney's Beauty and the Beast, which has a taken in $504 milion domestic and became the first movie of 2017 to cross $1 billion worldwide, with global total of $1.26 billion. Star Wars: The Last Jedi should have no trouble surpassing both of those tallies on both the foreign and domestic front, although it will still come far shy of breaking all of the record set by 2015's Star Wars: The Force Awakens, the first Star Wars movie to hit theaters in 10 years, including the highest opening weekend ($247.9 million) and all time domestic gross ($936.6 million). While everyone is talking about Star Wars and its box office dominance right now, there were some interesting trends that developed this year, many of which will have studio heads and creative executives trying to come up with new ways to chase those box office dollars, especially the summer season, with the summer 2017 box office sinking to an 11-year low, including the worst single weekend in 15 years. There will need to be some big changes in store to adapt to moviegoers tastes, which are shifting more rapidly than ever. For example, Blade Runner 2049, a movie that an a passionate group of fans had been looking forward to for more than 30 years, took in just $91.4 million at the domestic box office, and was out-grossed by movies like Girls Trip, Baby Driver, and even Wonder, which has quietly surpassed $100 million two weeks ago. With all of that being said, we're going all the way back to examine the entire year from top to bottom, and compare it with trends that have been set forth several years prior. We'll examine trends in everything from superhero movies to animated movies, sequels, remakes, reboots and everything in between, including, *gasp* original movies! We kick off this top 10 list with a trend that was bucked in a rather huge way this year, with one notable exception, so sit back and relax and enjoy this trip through the year that was 2017 at the box office. Animated movies are no longer a sure thing at the box office. R-Rated movies continued their box office resurgence. As of right now, there are two R-rated movies in the domestic top 10, the IT remake (#5, $327.4 million) and Logan (#8, $226.2 million). If Logan can hang on and stay in the top 10 when all is said and done (which it should be able to do), 2017 will mark the first year since 2003 that there have been two R-rated movies in the top 10 at the box office. That particular year, there was actually three, with The Matrix Reloaded, The Matrix Revolutions and Terminator 3: Rise of the Machines, and aside from The Hangover trilogy, most of the R-rated hits in the 14 years since have been one-off anomalies, like The Passion of the Christ, American Sniper and Ted. The massive success of both IT and Logan, along with other hits like Get Out ($174.4 million), Split ($138.1 million), Girls Trip ($115.1 million), Fifty Shades Darker ($114.4 million), Baby Driver ($107.8 million), Annabelle: Creation ($102 million) and Kingsman: The Golden Circle ($100.1 million) all surpassed $100 million at the domestic box office. Last year, only three R-rated movies crossed $100 million, Deadpool ($363 million), Bad Moms ($113.2 million) and The Conjuring 2 ($103.2 million) crossed the $100 million mark, so there shouldn't be any doubt that R-rated movies are back in a huge way at the box office. Low budget hit movies can bring huge box office returns. While January and February aren't often home to buzzworthy box office hits, two of the most talked-about movies this year debuted in this months and raked in big bucks on tiny budgets. Director M. Night Shyamalan's hit Split took in $138.1 million domestic and $278.3 million worldwide from just a $9 million production budget. Jordan Peele's directorial debut Get Out earned $174.4 million domestic and $254.3 million worldwide, from just a $4.5 million budget. Get Out has been deemed the most profitable film of 2017, with Split not too far behind, which makes sense since both films produced by low-budget specialist Jason Blum. While the top 10 is still dominated by big budget fare, New Line's IT has taken in $327.4 million domestic and $697.5 million from just a $35 million budget. Aside from Despicable Me 3, which had an $80 million budget, the rest of the top to movies were budgeted far over $100 million apiece. Movies like Girls Trip ($139 million worldwide, $19 million budget), Baby Driver ($226.9 million worldwide, $34 million budget) and Annabelle: Creation ($306 million worldwide, $15 million budget) managed to fare quite well without breaking the bank, so it's certainly possible that we could see more low-budget fare hit theaters, especially considering what happened to many of the big-budget summer sequels and reboots. Reboots and/or sequels are dying off, rather quickly. Of the current top 10 movies, four were released in the summer months, the same amount as last year, and despite this year's box office woes towards the end of the summer, there were still some big summer hits. Wonder Woman (#2, $412.5 million), Guardians of the Galaxy Vol. 2 (#3, $389.8 million), Spider-Man: Homecoming (#4, $334.2 million) and Despicable Me 3 (#7, $264.5 million) were the biggest hits of the summer, which certainly didn't as a surprise to any box office analysts, since they're all either sequels or based on popular brands. The big surprise, however, was that so many other projects that have thrived at the box office in the past, have fallen off so sharply. Pirates of the Caribbean: Dead Men Tell No Tales ($172.5 million), Cars 3, ($152.9 million), War For the Planet of the Apes ($146.8 million), Transformers: The Last Knight ($130.1 million) and Resident Evil: The Final Chapter ($26.8 million) all posted franchise-low domestic grosses this year, while high-powered movies based on hit franchises like Power Rangers ($85.3 million), The Mummy ($80.1 million), Alien: Covenant ($74.2 million) and Baywatch ($58 million}, The Dark Tower ($50.7 million), Rings ($27.9 million), CHiPs ($18.6 million) and Flatliners ($16.7 million) all failed to make a huge dent at the box office as well.